Gronkowski caught six passes for 79 yards, including two huge third-down conversions, and was a key blocker on running plays. Rob Gronkowski helped create the hole that Rex Burkhead barreled through to send the Patriots to their third straight Super Bowl. But the big tight end did much more than block in New England’s biggest game of the season. 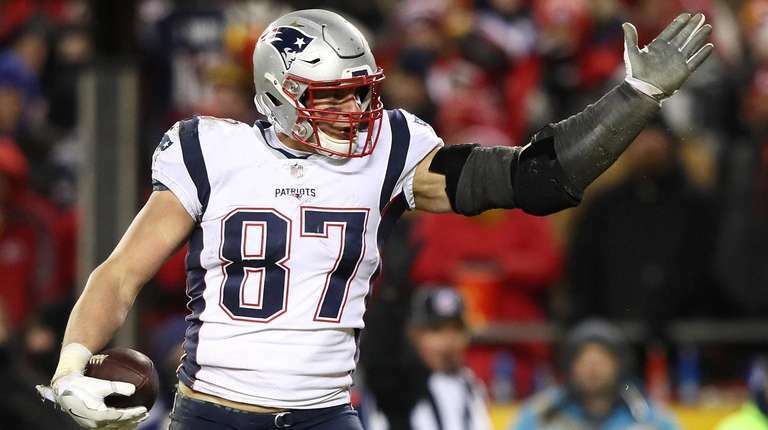 Gronk played like the old Gronk in the Patriots' 37-31 overtime victory over the Chiefs in Sunday night's AFC Championship Game. Gronkowski did plenty of blocking — and took out guys — against the Chiefs, helping New England amass 176 yards on the ground and four rushing touchdowns. But Gronkowski also was Brady’s top target. That hasn’t been the case for much, if not all, of the season. Gronkowski was targeted only once in last week’s Divisional Round game against the Chargers. Brady targeted him a season-high 11 times Sunday. When the Patriots needed a big play, or a third-down conversion, many times Brady looked to Gronkowski – and he came through. Gronkowski caught six passes for 79 yards, including two huge third-down conversions that set up the Patriots’ last two touchdowns. Gronkowski caught a 25-yard fade on third-and-5 late in regulation that put the ball on the 4, and Burkhead ran it in. In overtime, Gronkowski caught a 15-yard pass on third-and-10 that put New England at the 15. Three plays later, Burkhead scored to send the Pats to their third consecutive Super Bowl. There have been reports that Gronkowski could hang up his cleats and retire after this season. Now the reality is his last game ever could be the Super Bowl. But the fun-loving Gronkowski, and all of the Patriots, haven't been prone to look ahead. It’s about living in the moment, and that’s what he’s doing. “The way the guys have been fighting all year long, the way we fought this game, I couldn't be more proud to be on this team,” Gronkowski said. “A victory on the road, AFC Championship Game, it was one of my sweeter victories, definitely, in my career." Gronkowski hopes to have at least one more.